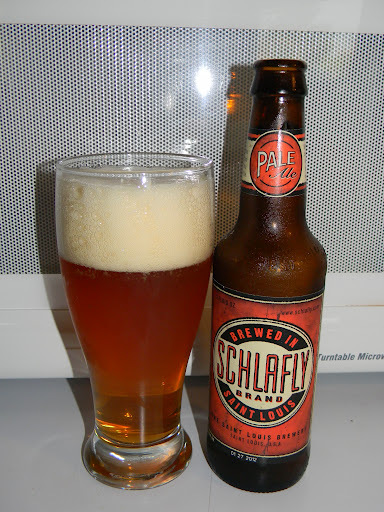 Review of Schlafly Pale Ale | Beer Apprentice - Craft Beer News, Reviews, Interviews and Info. For today’s craft beer review I’m going to be trying another brew from the St. Louis Brewing Company located in St. Louis, Missouri called the Schlafly Pale Ale. Heck with all the filler, let’s get to the website, schlafly.com, and find out all we can about this brew. Our flagship Pale Ale is a smooth, balanced, copper-colored session beer with mildly spiced flavor and aroma from the East Kent Goldings hops. The bready, lightly caramel malt complements the hint of fruitiness contributed by the London Ale yeast, making it satisfying and authentic; the perfect flagship beer for Schlafly. The brew comes in a 12 oz. bottle and it stands in at a relatively light 4.4% ABV. This Pale Ale poured a fairly clear, amber to orange color with some burnt yellow highlights around the edges and bottom of the glass. The collar was off white and of good size. It was soft, rocky and fluffy with an excellent retention time and lacing that was more than satisfactory. It didn’t look too bad at all. The nose brought forth very light and subtle hints of caramel malt combined with slightly toasted bread crust hints. Tones of grain along with some fruity aspects of apricot. The overall components smell rather earthy, but docile, and the balance was commendable. The taste was more of the same. Savors of caramel malt, grain and toasted breads. It was kind of sweet once that fruity apricot reared its head. It never became dominant though. Very meek to tell the truth. The hop characteristics were light, earthy and herbal. The bitterness was kept at a minimum to say the least. All in all, very tame an submissive I thought. Not bad, but just not a lot going on here. The mouthfeel was medium to medium/thin. It was smooth, crisp, refreshing and somewhat dry. The carbonation was decent and a creditable amount of flavor was left behind on the palate after each quaff. Well, this beer was ok. It was super easy to drink and it would make a killer session brew. Perfect for warmer weather when surrounding the BBQ pit or sharing with friends. It would be no problem to down several of these and not even think twice about it. Above all else, it was nothing too complicated or complex, however it did present a few nice aspects that could be discussed and pondered. I don’t know that I would seek out the Schlafly Pale Ale when beer shopping, however I wouldn’t turn it down if it were offered. If you see it, it wouldn’t hurt to pick it up and give it a try. You may find it to be the perfect brew for your session. Thanks for reading and commenting folks. I appreciate it.